Some months ago I reviewed a version of the Chivers Bull Shark retailing at around $34,000. 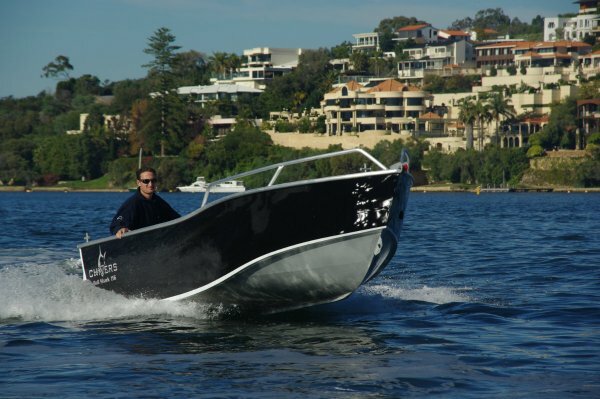 If that seemed a bit on the high side for a 4.7m boat then just under $20,000 for this version is verging on a bargain. It’s all a matter of paying for what you get. 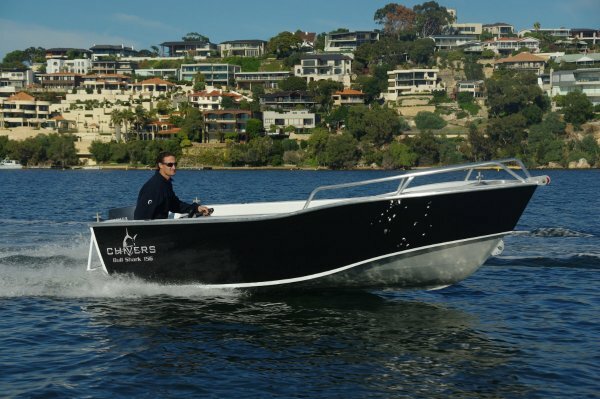 The earlier one was a fully equipped, powered-up tender for a mega-yacht; this one is for the budget conscious buyer who still likes his boats bullet proof. The open Bull Shark 156 verges on the indestructible with the same construction style as Chivers’ larger Sharks, featuring a 4mm bottom and 3mm sides, powerful coamings and a genuine motor well. It has the price-adding items of a full paint job, carpet and the like, but the moderator of that is a motor with two less strokes than are fashionable, controlled by a tiller and with no console in sight. I am quite a fan of smaller tiller-steered boats, or I have been since the generation with decently long tillers and logical controls turned up. The old stumpy tillers could get away from you in fast, tight turns and terrify nervous passengers. On the subject of passengers: you should always have one. With just a driver on board there is too much weight down aft. 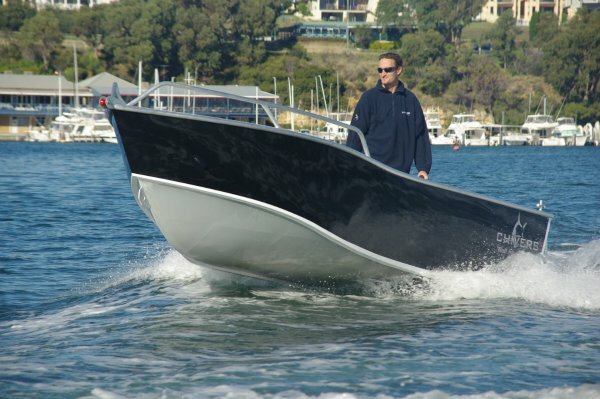 Speed will drop the nose, so dynamically you are OK, but the boat is unbalanced for lower speeds and head seas. Driving, you really are well aft, sitting to the side of the motor on a quarter box seat, the pair of these being foam filled to support the motor weight in the event of filling with water. The other main seat is a buoyant thwart forward in exactly the spot you want the ballast. All up, comfortable room and tail space for four, and buoyancy carried high enough for an upright flotation rating. 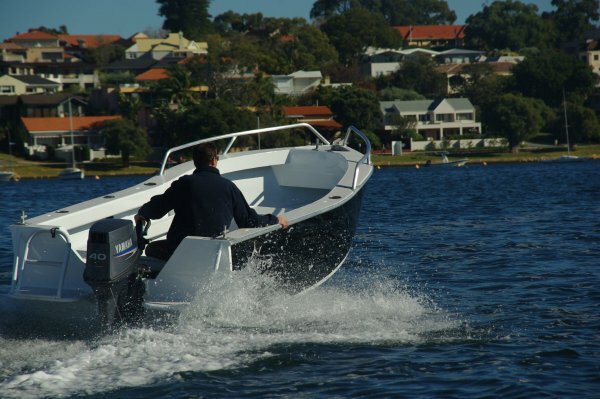 The review boat had a 40hp Yamaha two-stroke that gave respectable performance. It also had all the items to make a two-stroke civilized: electric start, trim and tilt, oil injection and effective ignition. You had to squeeze the bulb and understand what a choke did, but that was the extent of the pain. Versions of the boat have 75hp, and it can easily cope with this, but for an economy boat 40 does it well. Where do you want to go in any more of a hurry? Realistically this is an estuary, inside the reef sort of boat. What was noticeable was that it was also a glued to the water kind of boat at rest. Everything is relative, of course, but the Bull Shark seemed reassuringly stable with a couple of active people moving about. The fuel tank holds 50 litres, which would be ample in anyone’s opinion. Twice the capacity of two portable tanks it will handle a long day’s fishing with probably enough left over for tomorrow. Like all Chivers boats this one was organised so that wherever there was likely to be wear there was no paint. Rubbing strake (how laughable that there are still so-called rubbing strakes with paint on them), rails, cleats and surrounds and anchor well rim are all not only raw but polished. It is a decent sized well, and that is always welcome on a fishing boat, which this one inevitably is. The Bull Shark is not infested with fishing accessories, but that is usually an asset on smaller boats. An esky, for instance, is generally a mile more practical than a kill tank. You do get sinker cups-drink holders and rod holders, and these are certainly worth the installation. Probably, if you spoke nicely to the dealers, you could buy this boat completely unpainted or at least with a lacquer coating instead. You would get a boat you would not worry about scratching, you would save a thousand or two dollars, and you would have a boat that would never wear out. Or lose much value either. Worth a thought.